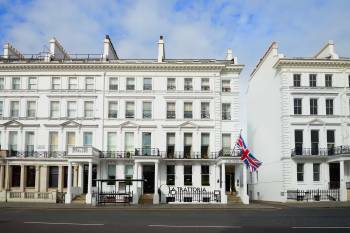 The Pelham is an elegant boutique hotel in the heart of South Kensington. It is located a short walk from the Natural History Museum and Kensington Gardens, which seem to have inspired the brightly colored interiors. Here one is surrounded by a romantic mix of elegant patterns and rich tones. It has long been considered among the most sophisticated places in London. Settle in and revel in the character of the wood-panelled drawing room and library. Make time for a little indulgence with an afternoon tea or a dinner at The Trattoria by Michelin starred chef Alfredo Russo. Step out and explore the boutiques and worldclass museums of Kensington. The hotel’s five versatile meeting rooms can be transformed to accomodate a variety of needs for events hosting up to 45 guests.From the classic meeting room – for seminars, presentations, a press conference or a board meeting – to the private dining room, for an exclusive gala dinner. With its sofas, armchairs and open fireplace, the drawing room is perfect for a formal event or a cocktail party, while the dark wood-panelled library is the ideal venue for a reception or baby shower.